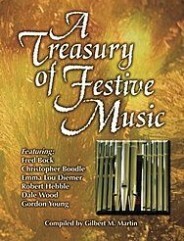 A Treasury of Festive Music for Organ by Gilbert M. Martin. For organ: 3-staff. Sacred, Dedications, General, Wedding. Intermediate. Published by Sacred Music Press (70-1446S). As the title suggests, this scintillating collection featuring six notable composer/arrangers will become one of your favorite organ books! All the selections are suitable for church dedications, weddings, anniversaries, and, of course, postludes. Any occasion where bright, merry and brilliant music is called for, this is the volume.